« Dress how you damn well want! I went to the vintage & retro fair at Marton Country Club today. I haven’t been for a few months, although I easily could because it’s only in the village. Anyway it wasn’t crowded, although there were plenty of people there and there were lots of goodies on display. I spent a while just wandering around looking, figuring that anything that caught my eye would still be there when I went back for it if I were meant to have it. 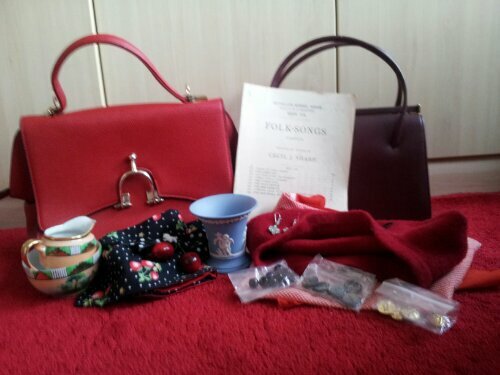 One vintage style bag, one vintage leather lined bag, a couple of scarves for my hair, a beret that had some pretty beads sewn onto it, buttons and earrings, a hair clip/brooch. The music book is for Dad’s Christmas stocking and the Wedgwood pot is intended for cotton wool buds. The milk jug and sugar bowl are very similar to a cup and saucer and cake plate that I have. As I don’t take sugar I’ve used the sugar bowl on my dressing table and the milk jug will go with my other china. The next vintage fair is on my birthday so I think I’ll nip down first thing and have a look-see before I am taken out for lunch. And we missed each other! I went about 12ish on my way home from Morrisons just incase I felt lazy after lunch!!! Lovely treasures! I’m especially fond of the horse bit adorned bag. Though I haven’t done much riding in my life, I’ve always been incredibly fond of elegant equestrian inspired fashions like that.